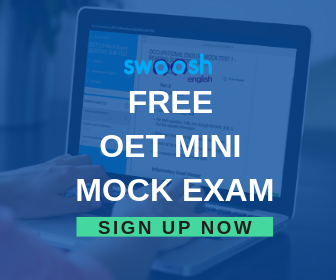 In sections B and C of the OET listening exam, you will have to answer a number of multiple-choice questions. Doing so successfully can often prove challenging for a variety of reasons and I personally have seen a number of students struggle in completing these tasks. Yet, if you cannot answer these sorts of questions well, you will lose a large amount of marks when it comes to the exam. In this article, therefore, I shall provide 4 proven strategies in order to help to improve your performance in this area. 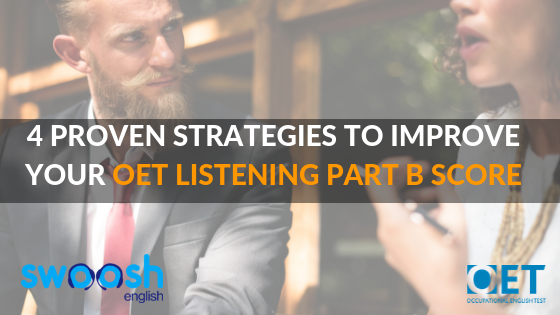 I shall focus specifically on OET listening part B, as the strategies vary between the two sections, but you should find some useful advice that you can apply to part C also. You hear a school nurse briefing staff about a new policy. Did you answer the questions successfully? Being able to do so will help you to prepare for what you are about to hear so that you are ready to focus on the information you need. This is very important as you will only hear this information once, so you must be as prepared as possible. This now relates to meta-skills; your ability to recognise what sorts of skills the OET exam questions are testing. 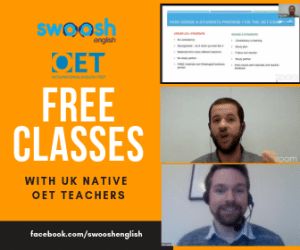 In OET listening part B, you will face questions which test for both gist and detail/listener course of action. A gist question is asking you about the overall listening text, for example, its purpose or general focus; a detail/ listener course of action question is asking you to detect a specific aspect of the listening text. Note, however, that doing this successfully will involve more than just hearing a specific word or phrase, more on this later. Look at the question A again. What skill do you think is being tested for here? You hear an ophthalmologist during a consultation with a patient? Which statement best sums up the ophthalmologist’s diagnosis? Ⓐ The patient is suffering from a historic condition. Ⓑ The patient has an irreversibly degenerative condition. Ⓒ The patient has had their condition diagnosed at a manageable stage. In this case, you’re being asked to “sum up” the information provided by the ophthalmologist. As a result, you will need to listen to all of the interaction, picking up contextual clues where appropriate (for example, references to time, general statements of positivity or negativity which relate to the condition) in order to answer the question correctly. As with all the listening sections of the OET, you will have to be prepared for paraphrasing. However, with the multiple-choice sections, the effect can be even more extreme. Unlike in section A, it’s possible that none of the words from the multiple-choice options will be used in the actual recording, so you will have to listen carefully in order to make the correct selection. If the answer to question B above were C, for example, then we might hear the doctor say something like “It is still possible to treat your symptoms”, which would give us the information to choose C despite none of the words from the option actually being used. This is because in both sections B and C of the listening, we are being tested on our ability to listen for the message of the recording rather than just the specific words. What do you call the incorrect options from a multiple-choice question? Answer: distractors. They are called this because their job is to distract you from getting the correct answer. The distractors may contain specific words which you hear in the text but they will not reflect the intention of the speakers. Imagine in reference to question B above that you hear “the condition is degenerative if untreated”. If based on this you decide to choose option B as being correct, you would lose the mark as the “if untreated” part of the recording strongly implies that the degeneration is not irreversible. Wasn’t that a powerful lesson you just learned today? I hope it helped you a lot. Do not hesitate to ask us any questions and put them in the message box below! Read the following question carefully and answer the four points referred to in tip 1. [Text Wrapping Break]You hear a paediatrician briefing her colleagues about a patient. When does the paediatrician say the patient can go home? Read the above question again. Is it a likely to be a question focussing on gist or detail/listener course of action? Listen to the recording and choose the correct answer A,B or C. Try to note down exactly what you heard which helped you get the answer. Listen again to make sure that you haven’t chosen any of the distractors. What information do you hear which may have distracted you?